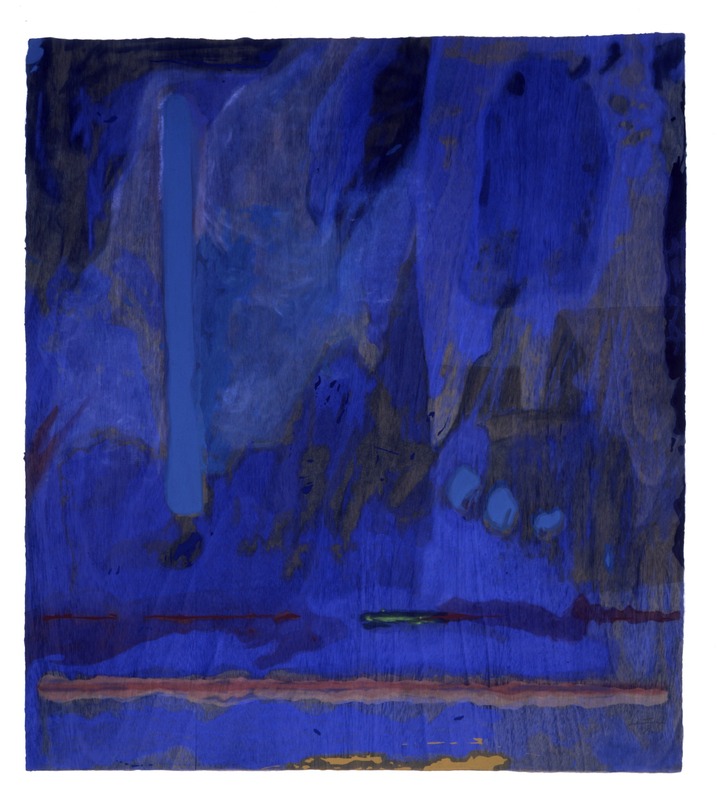 Helen Frankenthaler, American, 1928 – 2011 Tales of Genji III 1998 Woodcut and stenciling printed in color on handmade tan paper Image and sheet: 47 x 42 in. At the center of the City of Detroit’s heart is the Detroit Institute of Arts (DIA). For many reasons, including its world famous collection, exhibitions, events, film theater, classes and workshops, the DIA serves as an aesthetic anchor to the entire metro Detroit area. The December 15, 2015 opening celebrates the DIA’s 50th anniversary of one of its long-standing auxiliary support groups, Friends of Prints, Drawings, and Photographs (FPDP) with an exhibition curated by Nancy Sojka, head of Prints, Drawings and Photographs. The exhibit, 50 Years of Collecting Prints, Drawings and Photographs, marks her retirement from the DIA where she has worked since 1988. During her tenure she has organized more than 40 exhibitions from the DIA’s collection, including Ordinary People by Extraordinary Artists: Works on Paper by Degas, Renoir, and Friends (2014–15), Picasso and Matisse: The DIA’s Prints and Drawings (2012-13), Government Support of the Arts: WPA Prints from the 1930s (2009–10), The Big Three in Printmaking: Dürer, Rembrandt and Picasso (2006); Martin Lewis: Drawings and Related Prints (2000); Prints by Terry Winters: A Retrospective from the Collection of Robert and Susan Sosnick (1998–99), and Prints and Drawings in the Age of Rubens (1994). Among the featured works are Berenice Abbott’s New York at Night, Robert Frank’s Belle Isle Detroit, Erich Heckel’s Die Brucke poster, Edvard Munch’s Lovers, Charles Burchfield’s In the Parlor, Helen Frankenthaler’s Tales of Genji III, James McNeill Whistler’s Yellow House, Lannion, Martin Lewis’ Which Way?, along with selections from Robert Rauschenberg’s Bellini Series. The exhibition provides a small glimpse of the complete collection showing 125 art objects, (from a collection housing approximately 35,000 objects, that breaks down to 10,000 photographs, 10,000 drawings, and 15,000 prints) which includes a good number of local artists. Commenting, “The exhibit, What’s New – Recent Acquisitions in 2004 was evidence of the adventurous way in which Nancy grew the collection of art on paper at the museum. 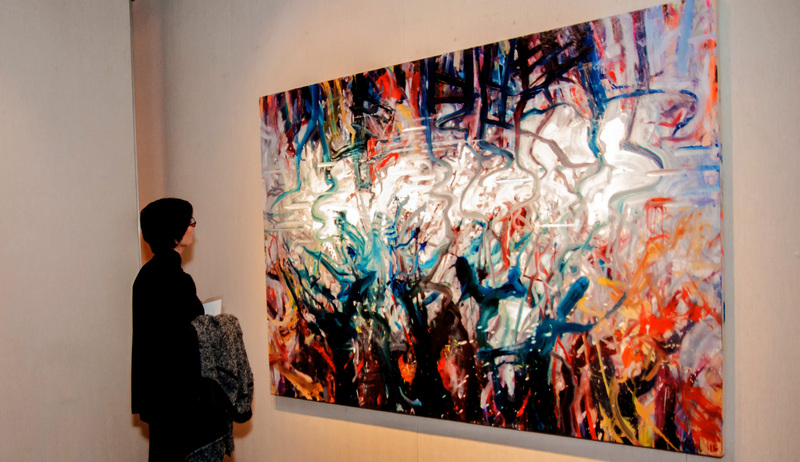 Nancy was very supportive of the artist’s in Detroit who worked on paper and I am deeply appreciative for her support over these many years.” by Doug Semivan, Art Chairman of Madonna University. 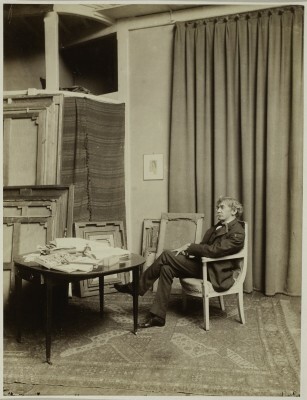 Paul François Arnold Cardon, French, 1859 – 1941 Whistler in His Paris Studio at 106 Rue Notre Dame des Champs 1892 Albumen print mounted to board. Sheet and image: 17 x 14 in. French photographer, Paul Francois Arnold Cardon, or Dornac, specialized in personalities, and took this 17 X 14 photo in 1892 using the albumen print process mounted on board. The photo captures a rare moment of James A. M. Whistler, the American-born, British-based artist in his studio whose Yellow House, Lannion is also part of the exhibition. This image is a moment in time just as the art of photography starts to develop throughout Europe. The photograph was a gift of Leonard and Jean Walle. The Hungarian photographer André Kertész spent many years in Paris and is known for his aerial black & white compositions that often capture the effects of low light casting long shadows on his subjects. After his education in 1912 at the Academy of Commerce in Budapest, he eventually found his way to Paris, where he spent the majority of his life producing portraits, streetscapes and distortions. When I visited the Getty Museum in 1996, the museum had recently purchased all of his remaining work and had just mounted a retrospective. 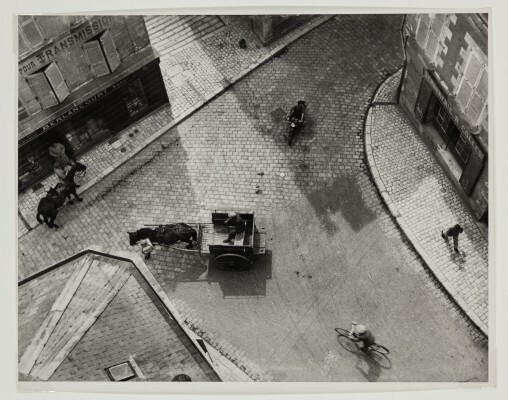 Kertész brought a unique vision to the art of photography and influenced generations of photographers that followed. The untitled 24 X 20 photo print by Seydou Keita typifies the work by this photographer from Bamako, Mali who spent much of his life photographing the people of this once-French colon. The self-taught photographer was introduced to his Kodak Brownie Flash camera in 1935 by his uncle and went on to pursue a career as a professional photographer. 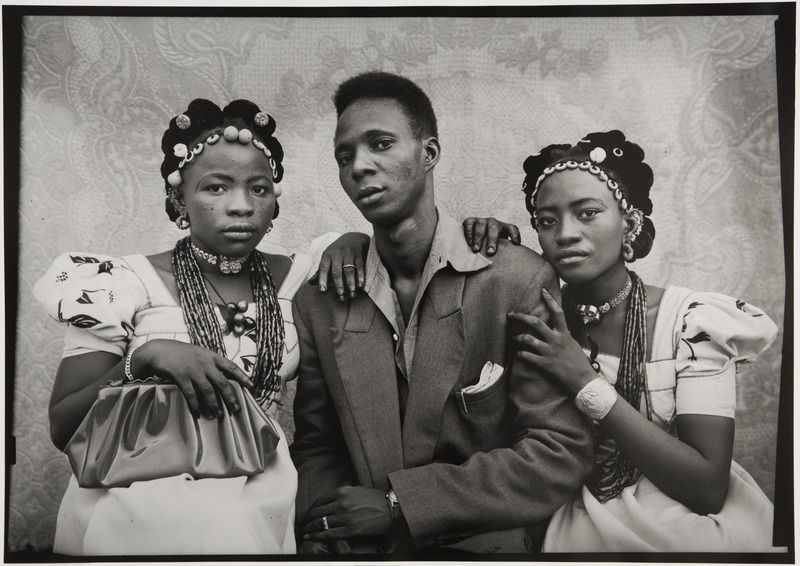 His strict sense of formality is combined with his ability to develop a level of intimacy with his subjects and capture a moment that withstood time. This photo was a museum purchase, with funds from William and Ellen Kahn. 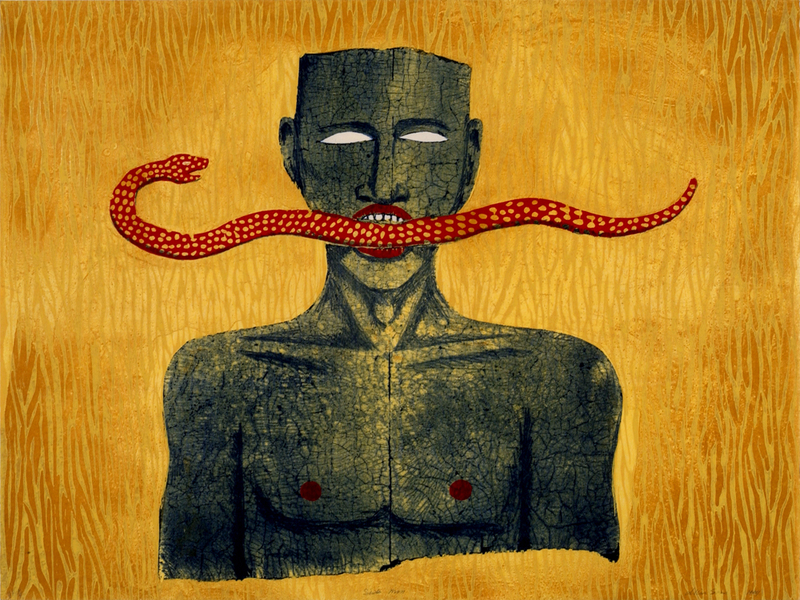 A younger artist from the west coast, Alison Saar, has created a color woodcut and lithograph, Snakeman, 1994, (a gift from Marc Schwartz). She is a well known African-American artist whose work explores themes of African culture and spirituality. A recipient of a Guggenheim Foundation fellowship and a fellowship for the National Endowment for the Arts, Saar’s work has often included a variety of materials (bronze, lead, tar and wood) with which she creates a highly personalized amount of cultural context in her painting, sculpture and print formats. It could be said easily that Walker Evans is one of the most influential artists in the twentieth century and the progenitor of documentary-style photography in the United States. Although I had read about his work during my college years, it was the retrospective of his work at the Metropolitan Museum of Art in New York City in 2000 that left an indelible impression. Born in St. Louis, Missouri in 1903, Evans spent a year at Williams College where he indulged himself in literature and where he first envisioned himself as a writer. Fortunately for the art world, Evans gradually redirected himself toward photography. His lifetime of photography took him through the Depression years during which he worked alongside Dorothea Lange, Arthur Rosthstein, and Russell Lee as part of the government New Deal agency. He had been assigned to capture the essence of American life. His black & white images were of people found along the roadside, cafes, home interiors, and small town main streets. 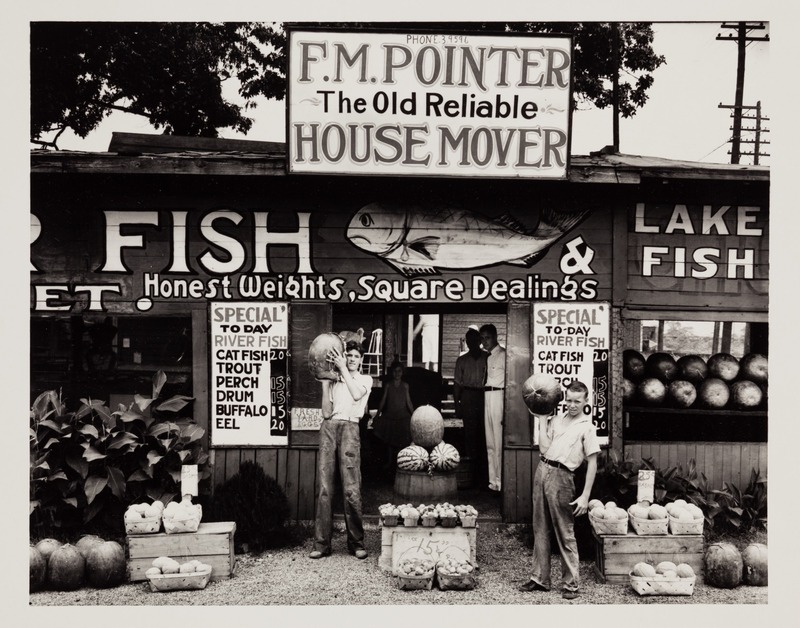 The photograph, Roadside Stand, from 1936 is a gift from Beverly Franzblau Baker, in memory of Morris D. Baker. This aquatint and dry-point print from the work of Richard Diebenkorn, Folsom Street Variation III, 1986, gives us information about a West Coast abstract expressionistic painter who also engaged in printmaking. Best know for his abstract landscape series, Ocean Park, Diebenkorn’s work seems rooted in the outside world. His works on paper also included drawings using gouache and crayon, but it is his large body of painting that retains a quiet and distinctive intensity while presenting the viewer with an informal use of space, as oppose to, say, Piet Mondrian. The print is a gift from Dr. and Mrs. Robert J. Miller and Dr. and Mrs. Robert Moss. The 125 pieces selected by Nancy Sojka and her staff for the exhibition 50 Years of Collecting Prints, Drawings, and Photographs serves as a nice send-off for Sojka and her years of work at the Detroit Institute of Arts. In this exhibition, she pays some attention to the Detroit artists in the collection, including Stanley Rosenthal, Janet Hamrick, Bill Rauhauser, Norman Stewart, Dave Jordano, Doug Semivan, Susan Campbell and others. As the public focuses on exhibitions of painting, sculpture, film and installation, let us not forget about the drawings, various print forms and photographs that rest in this grand collection at the Detroit Institute of Arts. As a young, aspiring painter, before I had any idea that Rick Vian was a local artist, I greedily snipped out every advertisement from Art in America his work was featured in and collaged them into my journal, alongside the work of other painters who inspired me. I loved the way his work rode a Rothko-esque razor’s edge between abstraction and representation (channeling Rothko as well in subjective spiritual punch) and how smartly it appropriated recognizable phenomena that were already abstract, such as reflections and strange effects of atmosphere and light, into works that were as much about form and surface as they were about content and illusion. Seeing Vian’s recent work this week, therefore, felt doubly special- being surrounded by masterful, imposingly scaled paintings that come from a body of work I’ve followed closely for years. The title of Rick Vian’s retrospective, currently on view at Robert Kidd Gallery in Birmingham- Using the Whole Chicken– belies the perceptive, multi-layered formal gravitas that unfolds as one moves from piece to piece. Consisting of paintings spanning 1972 to 2015, Using the Whole Chicken, takes as its prima materia two iconic spiritual forms from two vastly different faiths- the Western Baroque genre of trompe lois church ceiling paintings (Vian mentions two ceilings in Roman churches in his artist statement, painted by Giovanni Battista Gauli and Andrea Pozzo) and the Eastern mandala (or mandorla, which, as Vian points out, appears in early esoteric Christian and Islamic art as well). Both forms seek to foster a transcendent spiritual experience, delivered visually- Both consist, very basically, of a round, bright center surrounded by darkness. 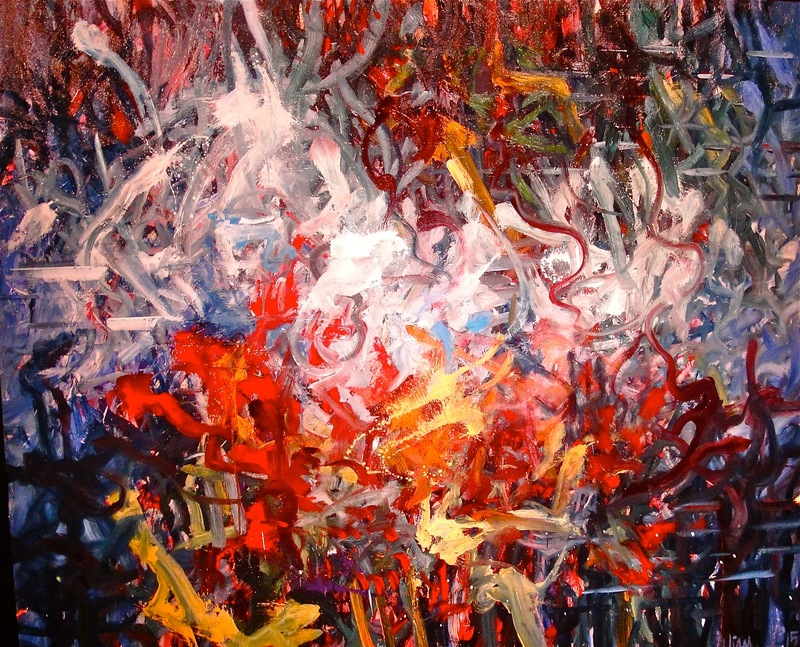 Vian takes this visual coda of contemplation and transcendence outward, into nature, and inward, into the visual cortex of the human brain- an interesting conceptual mirror for the outer journey of Western painting, with its focus on beauty, perspective, and high illusion, versus the inner path of Eastern aesthetics with its deceptively simple abstractions and vague, groundless atmospherics that channel a more subjective, synesthetic experience of the world. Vian’s great gift as a painter is his apparently effortless ability to conjure images that are at once fully nonobjective and grounded in depth- windows onto the world in the Italian Renaissance tradition. The paintings in Using the Whole Chicken appear before the viewer’s eyes as formal abstractions, while creeping up behind the eyes as atmospheric landscapes. Their surfaces are formal, their deeper implications illusionistic. The more time one spends with a Rick Vian painting, the more subtle, ungrounding, and revelatory this interplay becomes. Viewing just the south-facing wall of the main gallery at David Klein Gallery’s new downtown Detroit location, you might never imagine that there are three different artists included in the current show, Economy of Form: Matthew Hawtin, Mary Kim, and Mark Sengbusch, which held its opening reception on November 14th, and will run through December 24th. 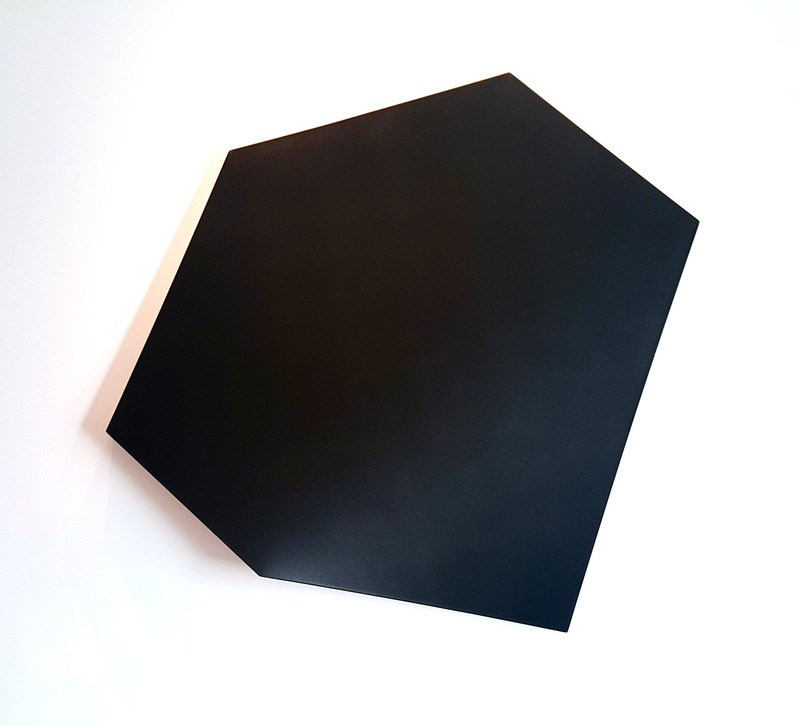 Closest to the door is Pitch, a six-sided monochrome piece in matte black by Hawtin—a dimensional canvas that resembles an iconic jewel shape tipped on its side. 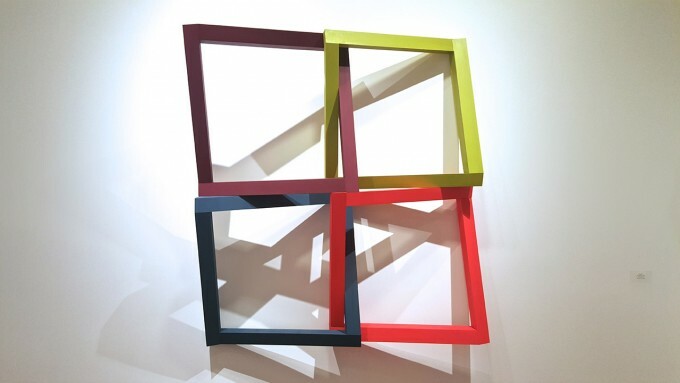 This flows in seamless conversation with Kim’s Two circles, which conveys two roughly circular forms made out of rigid lengths of wood, likewise bending outside the 2D plane, and swathed in bright acrylic shades of chartreuse and red. The wall terminates in Sengbusch’s Gibson 6, which distills his signature set of symbols, laboriously scrimshawed into acrylic-painted wood, into six scaled-up details in shades of matte black and grey. Spare arrangements, vibrant monotones, and careful use of geometry is present in all three bodies of work, and the exhibition title refers to a characteristic of the term “hard edge,” first applied to Four Abstract Classicists, which opened at the San Francisco Museum of Art in 1959. 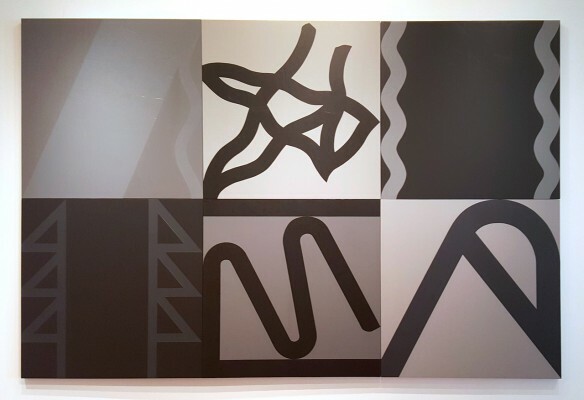 The artists featured in the 1959 show were John McLaughlin, Lorser Feitelson, Frederick Hammersley, and Karl Benjamin, and give clues to some of the formal inspiration for the artists on display at David Klein—as indeed they have spawned entire generations of work springing from these starting points, including that of Ellsworth Kelly, Robert Indiana, Paul Feely, and numerous others. Perhaps rising less automatically to mind and representing a more unique expression of these artists individual visions are some wellsprings of inspiration that fall outside the contemporary arts canon; Kim’s second Master’s degree in architecture transformed her previously more traditionally 2D approach to painting into the 3-dimensional constructions that just from the walls at hard angles; Hawtin’s almost two-decade long experiments with the “torqued canvas” that removes the physical structures of the painting stretcher and frame; Sengbusch’s obsession with seminal science fiction writer and visionary futurist William Gibson. In some ways, the three artists in this group show work together so perfectly because they have each chosen to zoom into the fine details of one traditional element of painting—Kim’s works are entirely stretcher and or/frame, Hawtin’s are obsessed with the canvas surface (sometimes actually fiberglass, affording a preternaturally smooth finish), and Sengbusch has generated an elaborate vocabulary of original signifiers. This last elevates Sengbusch’s work to a unique level, translating his source material into a visible and new language that goes beyond art history, and breaks into future territory. But while writers like Gibson are necessarily preoccupied with the meaning of words, Sengbusch is concerned with the form, the literal design of language—a rich subject for investigation. To create language without meaning is a truly difficult task, when you consider the awesome power of the human mind to translate symbols as diverse as a musical note, hànzì or kan’ji (Chinese and Japanese characters, respectively), or the letters you are currently reading into meaningful sounds, and Sengbusch’s finished canvases of course lend themselves to interpretation, when viewed by anyone trained to seek meaning from signifiers. Altogether, a very strong show at David Klein Gallery, with allusions to the rich lineage of minimalist and hard edge traditions, and a few new twists thrown in to keep the conversation moving!